I urge the FERC Commissioners to reject the proposal by PennEast to construct a brand new pipeline through environmentally sensitive and publically preserved portions of New Jersey and Pennsylvania. We do not need this dirty infrastructure in our states to carry polluting fracked gas. This project is not in the public interest as additional gas supplies are not needed in New Jersey. This project is about destroying our wetlands, waterways, and forests to increase profits for the gas industry. Do not allow this dirty project to move forward. We moved to Hopewell Township in large part because of the beautiful surroundings and have continuously supported preservation of our farmlands and open space. This pipeline will mar that landscape, endanger our families, destroy wildlife habitats and forever change the areas that we cherish in the name of greed. Please reject this proposal. Instead of investing in long term infrastructure for more fossil fuels, we need to be investing in alternatives like solar, wind, demand response and energy efficiency that do not threaten the environment and our public health. 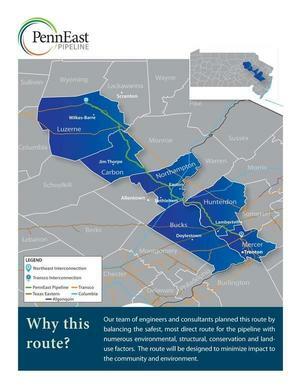 (WYOMISSING, PA) — PennEast Pipeline Company, LLC, announced today that Spectra Energy Partners (NYSE: SEP) has joined in the development of its PennEast Pipeline. The proposed interstate natural gas pipeline will transport clean, affordable and abundant natural gas to reliably meet growing energy demand in New Jersey and Pennsylvania while providing environmental and economic benefits to the region. Spectra Energy Partners becomes the sixth member of the PennEast Pipeline Company, LLC. It joins AGL Resources; NJR Pipeline Company, a subsidiary of New Jersey Resources; PSEG Power LLC; South Jersey Industries; and UGI Energy Services (UGIES), a subsidiary of UGI Corporation. Spectra Energy Partners and PSEG Power each have a 10 percent interest in PennEast; the remaining member companies each have a 20 percent interest. UGIES is the project manager for the development of the project and will operate the pipeline. There’s an interactive route map. The 108-mile, 36-inch diameter PennEast Pipeline will transport one billion cubic feet of clean, natural gas per day — enough to serve approximately 4.7 million homes. It will run from Dallas, Luzerne County, in northeastern Pennsylvania, to Transco’s pipeline interconnect in Pennington, Mercer County, New Jersey. PennEast has initiated the Federal Energy Regulatory Commission Pre-filing process and plans to file a formal application in the third quarter 2015. Pending regulatory approval, PennEast anticipates a November 2017 in-service date. For additional information, visit penneastpipeline.com, call toll-free (844) 347-7119 or send an e-mail to answers@PenneastPipeline.com. Or go to Stop the PennEast Pipeline or to NJ Sierra Club or Delaware Riverkeeper Network, which have been organizing opposition meetings. See also pipeline proponents touting open houses as a new tactic.